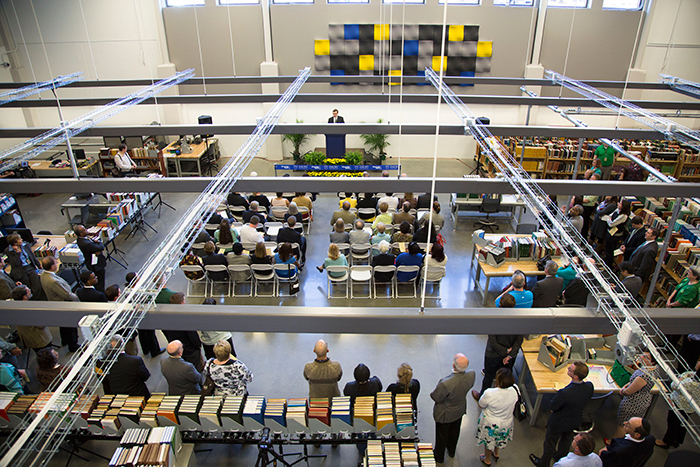 The Library Service Center dedication was held on the floor where books are processed into the center's collections. 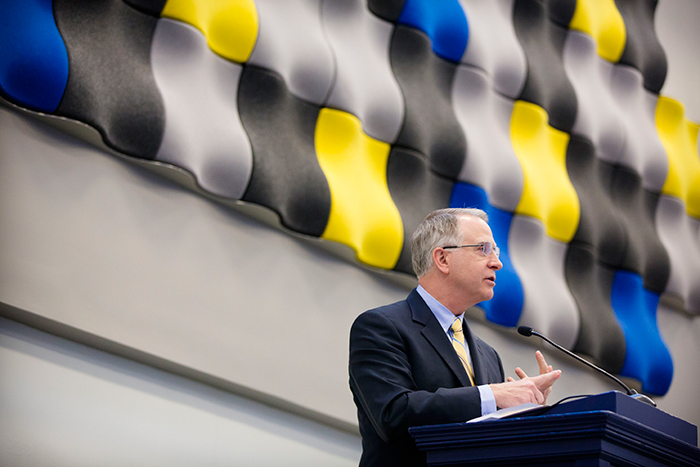 In remarks at the dedication, Emory President James Wagner praised the partnership with Georgia Tech. The ceremonial ribbon was cut by, from left, Jack Tillman, president of EmTech; Rich Mendola, Emory senior vice provost of library services and digital scholarship; Yolanda Cooper, Emory University librarian; Catherine Murray-Rust, vice provost for learning excellence and dean of libraries at Georgia Tech; Emory President James Wagner; and Georgia Tech President G.P. "Bud" Peterson. The Library Service Center, which will hold two million books by this summer, features 32-foot-tall shelves. The facility has the capacity to house about four million volumes. Massive air-conditioning units keep the temperature to 50 degrees, optimal for preserving the library's collections. 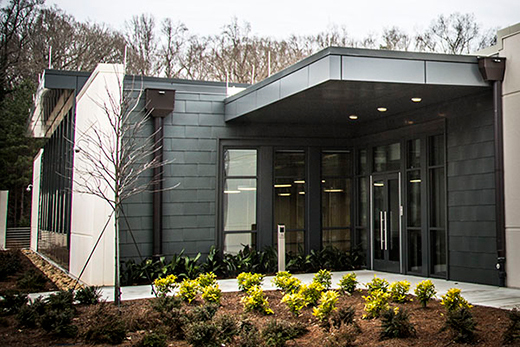 The state-of-the-art facility is housed on Emory's Briarcliff Property. VIDEO: Emory University Project Manager Felicia Bianchi discusses the partnership between Georgia Tech and Emory for the Library Service Center. VIDEO: Heath Miller, director of project management for Emory University, explains the many unique features for the recently dedicated Library Service Center. 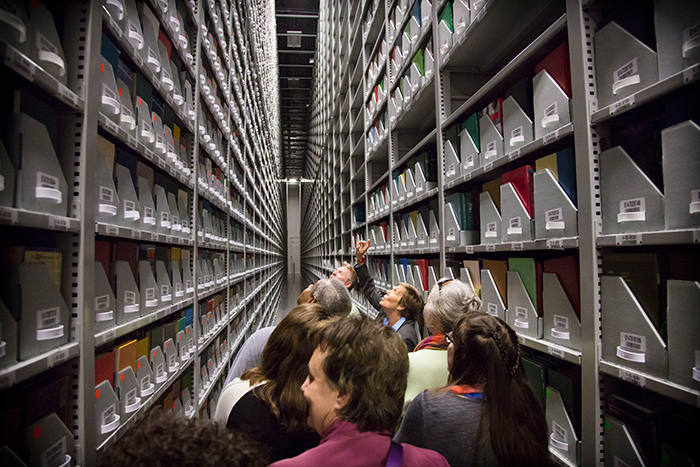 • The 55,000-square-foot facility has room to expand, accommodating an additional archive module. • The archive module will house around 95 percent of Georgia Tech’s and much of Emory’s library collections. Once ingest is completed this summer, it will hold more than 2 million volumes, with the capacity to house about 4 million volumes. • Books are stored on 32-foot-tall shelves, which are accessed by specialized Raymond forklifts. • To steady forklifts and shelving, the LSC is built on a “super-flat slab,” meaning that the grade varies less than the thickness of a nickel over 10 feet. • For optimal, long-term preservation, the archive module is kept at a steady 50 degrees Fahrenheit and 30 percent relative humidity. • For fire suppression, the building is equipped with sprinkler heads that can deliver 25 gallons of water per minute; a 157,000-gallon water tank helps feed the system. • Book requests will be delivered to campus locations twice daily, with mediated service available for rush/on-demand delivery. Electronic delivery of scanned materials is also available. 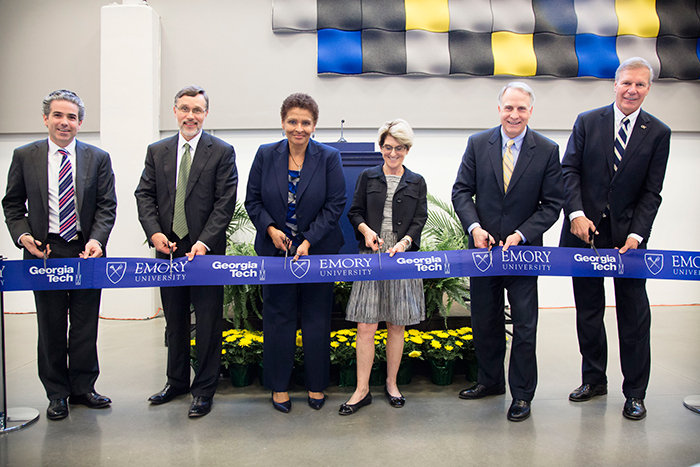 The state-of-the-art Library Service Center (LSC), created by Emory University and the Georgia Institute of Technology to house a shared collection amassing millions of books and other materials, formally opened Thursday after a joint dedication ceremony. 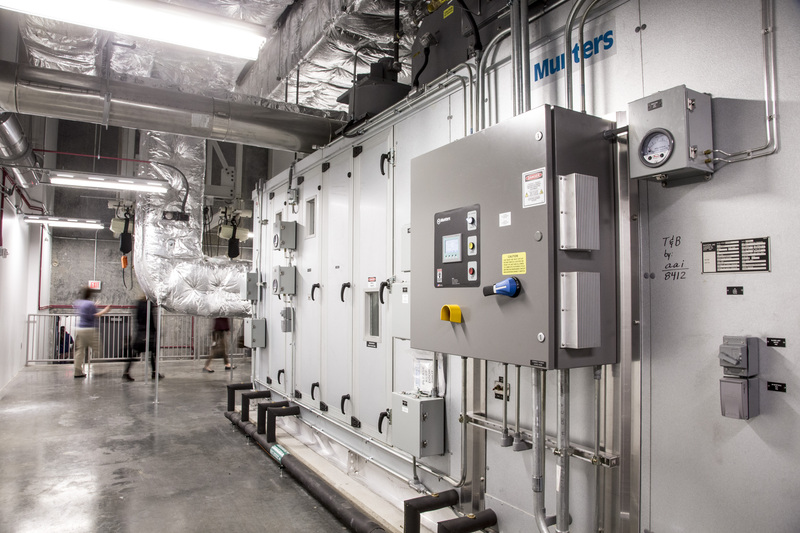 Stretching across 4.6 acres near the back of Emory’s Briarcliff Property, the climate-controlled 55,000-square-foot facility was developed to create a seamless, unified collection of materials that will be available to faculty, staff and students at both campuses. The LSC will house around 95 percent of Georgia Tech’s collections and much of Emory's collections, with projections of reaching more than 2 million volumes by this summer. Items will be available for delivery to the main campuses at both universities. Developed in collaboration between Emory and Georgia Tech, the joint project marks the latest chapter in a longstanding public-private partnership between the Atlanta-based institutions and offers advantages for both universities. Not only will the LSC provide optimal conditions for the secure, long-term preservation and storage of books and related materials — including film and microform collections — it brings key content from two major research university libraries under one roof, expanding access to a broad range of resources and freeing up campus spaces. He noted that it was on Emory’s Briarcliff Property that the universities joined forces more than 15 years ago to create EmTech, originally a biotechnology business incubation initiative to provide infrastructure for biotech start-ups. “Investments like this insure that the library will continue to be a crucial part of each of our institutions and more importantly a crucial part of the educational experience,” he said. 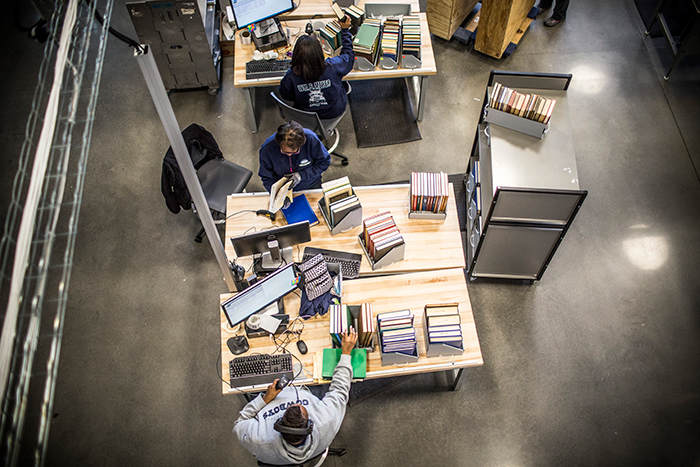 Shared library service centers mark a new direction for higher education, and a partnership model now growing in popularity. “This building is a symbol of a remarkable collaboration between two complementary institutions of higher education and it represents a new level of research library cooperation in the United States,” she said. The LSC dedication culminates four years of project development, drawing upon the expertise and staffs of both universities. Each institution contributed equally to the facility's construction and will continue equal support for operations funding. With libraries that feature complementary strengths, only about 17 percent of the Georgia Tech and Emory collections overlap, which means that "together we have an exceptional collection that benefits both campuses," explains Yolanda Cooper, university librarian at Emory. "Our goal is to leverage the services we can provide across both institutions, enhancing our ability to meet the changing needs of users and to develop new resources and tools for use in research, teaching and learning." A single-site location for collections from all Emory libraries. Expanded electronic access for faster, more efficient service. Enhanced preservation and security to heighten collection protection. A reading room to view materials onsite with technology that allows for virtual connections with outside research colleagues. Users can request items through discoverE.